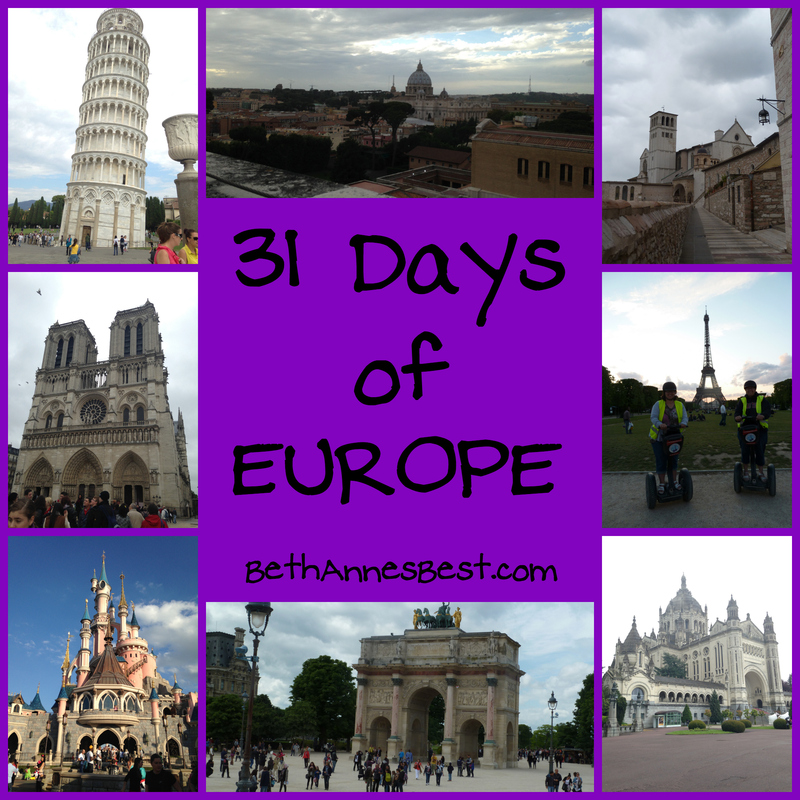 This is Day 8 of my 2014 trip to Europe. If you want to read the other posts about my trip go here. Today was another travel day. I didn’t realize how much traveling we would be doing in Greece until we got to this part of the trip. 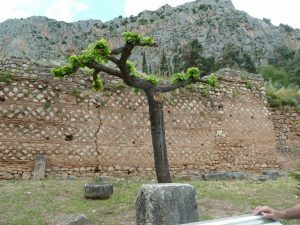 After getting off the ferry the night before we just stayed in a hotel nearby for the one night and then this morning we headed to Delphi! 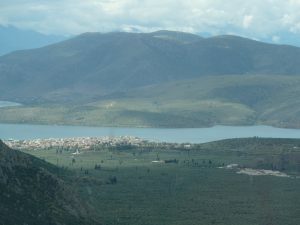 The bus ride to Delphi was about 3 hours long. Halfway through the drive the driver stopped for us to get out, use the restroom, and get a drink or snack. We stopped at the Greece equivalent of a truck stop. After we got to our hotel and checked in we had lunch. 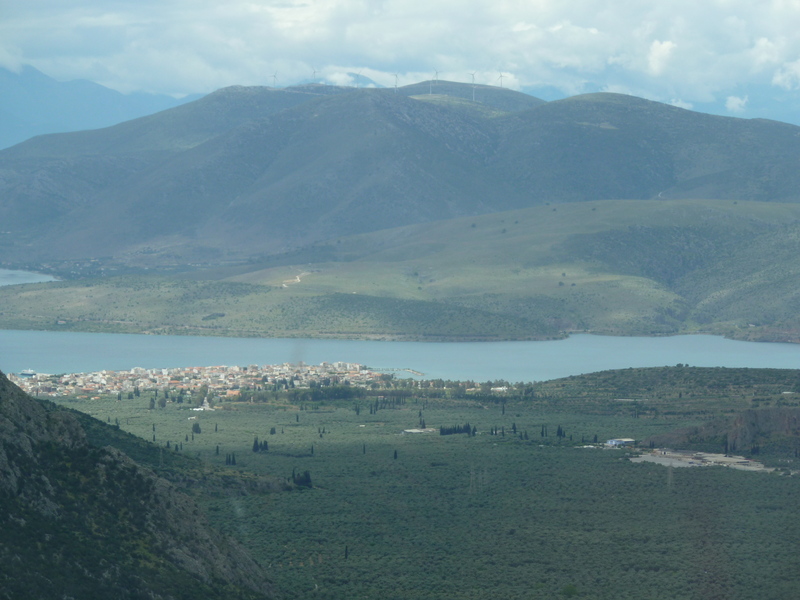 The place we ate lunch at had a great view of the mountains of Delphi. It was breathtaking. 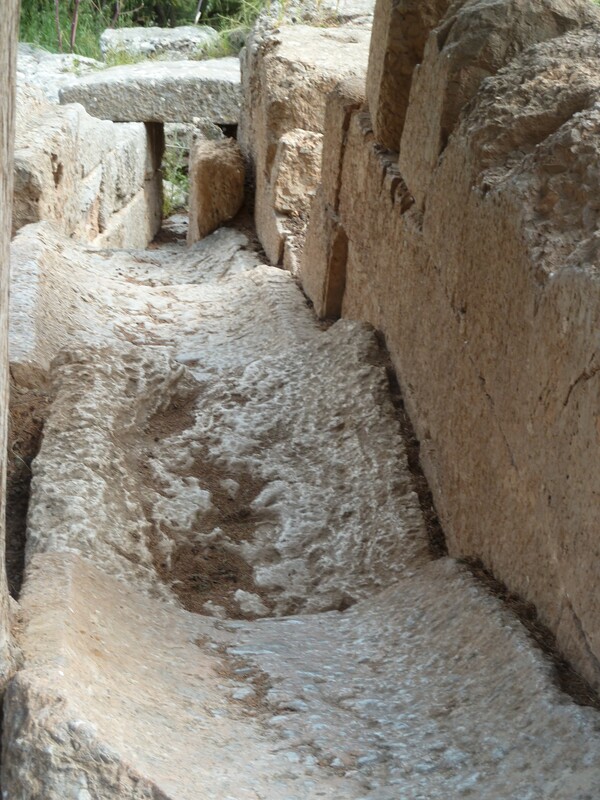 You could see for miles and even were able to see the Bay of Corinth (yes the same one from the bible). We wanted to go to Corinth as we thought that was what was down there but the bay started here and ends about 4 hours away in Corinth. 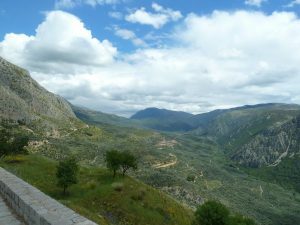 You can take a footsteps of Paul pilgrimage in Greece…another trip. I really enjoyed the food at this meal. For the first course we had a plate of about 5 different Greek appetizers. 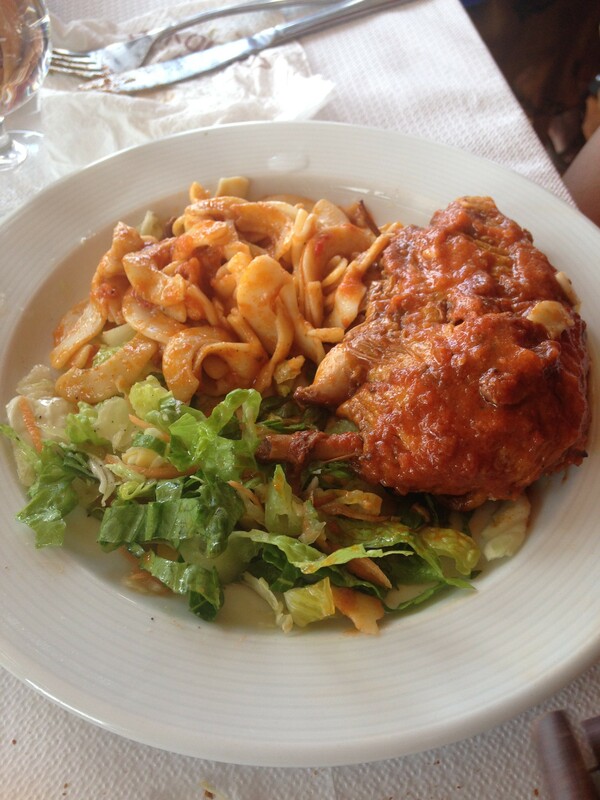 Then the main course was a chicken in a tomato sauce with pasta. It reminded me of a course I make at home with chicken in tomato sauce, it was soo good. Going into this trip I wasn’t sure how I was going to do with the food in Greece. I haven’t had a lot of Greek food and some of the Greek food that I have had wasn’t that good. 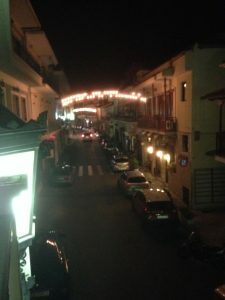 But I can say that I enjoyed the food in Greece a lot and there wasn’t much I disliked. I felt that the food was part of the culture in itself. So many times I have gone on vacation to a place far away from my hometown but the foods I ate were just like foods I would eat at home. I feel like in the states we eat in a lot of chain restaurants so we never get out of our comfort zones. Going to Greece has helped me try and break away from eating the same things all the time and go out of my comfort zone, and try new things. 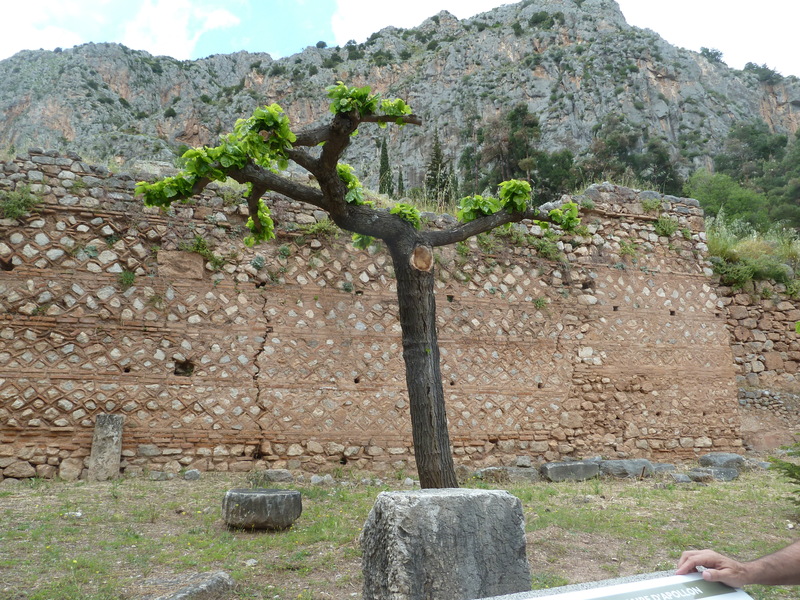 After lunch we headed to the Archeological Museum of Delphi. This museum was set up almost the same way it was set up in Santorini except the archeological site and the museum were all in the same site. First we did the outdoor archeological site. The one thing I remember in this site was that all the ruins were HUGE. I learned that this place is the belly button of the world and was a meeting place for many. I enjoyed looking at the ruins and then learning and thinking about how that area was used. For example in this photo we were able to tell that it was used as an aqueduct to get water from the top of the mountain to the bottom. I felt like these ruins are the Greek ruins that you see in movies. There were huge columns bigger than people with nothing else surrounding you. Within the ruins was an amphitheater that you could actually perform in. There were several other groups there that day and they all did performances in the amphitheater. Several of my classmates performed a page from Euripides. After going through the ruins we went over to the museum. Inside the museum they had different statues and artifacts that were once in the ruins that we had just walked through. Unlike the museums we went through in Santorini and Athens the artifacts in this museum were much different. The statues and artifacts in this museum were HUGE, just like the ruins. I feel like the artifacts in this museum had a lot more detail than any of the other places we visited. But I can’t decide if that is the case because the objects were just bigger so it was easier to tell or if they really did have more detail. I did notice in this museum it did a good job of explaining the details on the different objects. A good example of this is in the Circular altar below. 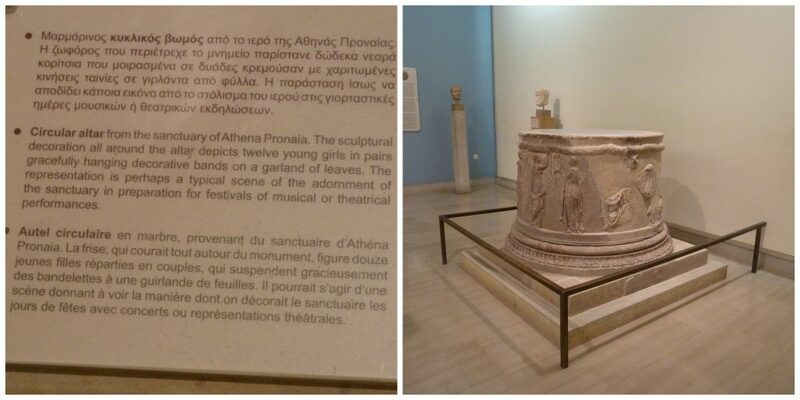 The placard in the museum explained where the Circular altar came from and who is on the altar and what the scene is from. After the museum we headed back to our hotel and got ready for dinner and to walk around downtown. 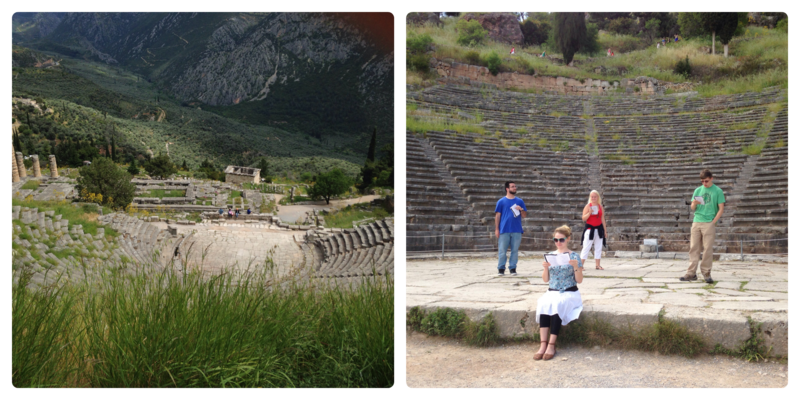 In Delphi it was pretty empty but we managed to meet some interesting people. Many of the shop owners welcomed us with open arms and were very friendly. There were a lot of markets in Delphi, which was nice to buy drinks and snacks for the off periods of the day. I bought the last of my postcards to have one from every part go Greece I visited since I collect postcards for postcrossings.com. Throughout the evening several of us sat and talked about our experience in Greece and reflected on the last 8 days of traveling. It was really nice to talk with other people about what they liked and disliked about the trip. Our hotel rooms all had balconies and we had an awesome view of the street down below. The city was lit up nicely at night and I was glad to be able to enjoy the balcony and the view.